Sagittarius is a gorgeous constellation visible during the summer months in the northern hemisphere. Explore the mythology, star pattern and celestial objects that lie within the borders of the zodiacal constellation of Sagittarius. Sagittarius is mostly identified with Greek Mythology, in which he is depicted as a centaur. This half human and half man carries a bow and arrow that is aimed toward scorpius in the sky. However, there is some haziness in the history as to who this creature really was. Sagittarius was first associated with Nergal, an ancient Sumerian God of War that shot arrows. Sagittarius was first associated with Nergal, an ancient Sumerian God of War that shot arrows. There are other depictions of Nergal, like the one you see above, that shows the god as a half man and half lion. It is possible the Greek adapted this constellation to fit their own mythologies. Historians debate who this constellation truly represents. Sometimes Sagittarius is identified as Chiron, who was a wise and benevolent creature that trained many Greek Heroes, such as Jason, Theseus, Heracles, and Achilles. The heart of the Milky Way sits right within Sagittarius, and I for one never tire of looking all the celestial objects sprinkled throughout this constellation. In fact, in your are observing in a dark enough place, the deep space celestial objects stand out much more than the constellation itself. NASA’s Hubble Space Telescope was recently use to search for extrasolar planet candidates by pointing it’s mirrors toward the central bulge of our galaxy located 26,000 light years away. This project was called the Sagittarius Window Eclipsing Extrasolar Planet Search, abbreviated to SWEEPS. The Hubble looked at 180,000 stars in this small window and were able to find potential stars that have characteristics for exoplanets to exist. You are looking at one quarter of the diameter of the Milky Way’s spiral disk. Out of 180,000 stars, 16 of those have potential to have planets (at the time this was written). Sagittarius is an amazing constellation to view, and I recommend when you look for it during the summer months to find a dark sky to observe it because there are so many deep sky objects to see. 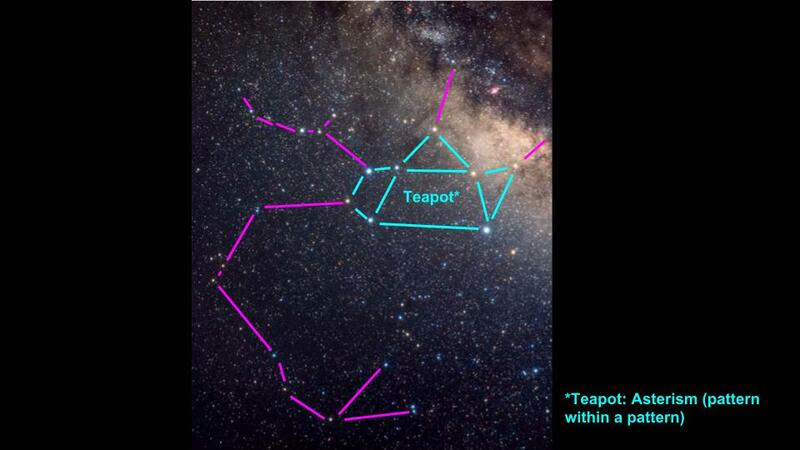 Remember to look for the asterism called the Teapot within the borders of this constellation. Good luck on your hunt for The Archer!